Today appears to be Google app update day, as we have already seen updates for both Gmail and Google Voice.Hangouts is the latest to join the party, with an update that makes it easy to see who is reachable. Yes, we’re talking status icons that are either green or grey depending on someone’s availability. You’ll also be able to browse contacts quicker, pinch-to-zoom in photos, find Hangout invites easier, and hide people from the new Hangout screen by long pressing their name. The update, as always, will be a staged rollout. 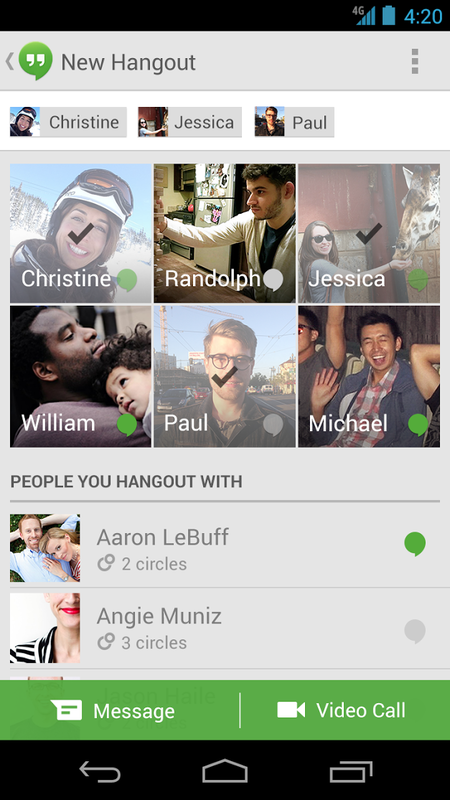 You can finally see who is on Hangouts! When you start a new Hangout, green icons show who’s on, and gray shows who’s not. Contacts are now organized by People you Hangout with, Suggested People, and Other Contacts. Long press contacts in the New Hangout screen to hide them. Invites are now above your conversations so they’re easier to find.